One of the few true 3D options available currently, the Panasonic Lumix 3D1 is designed for anyone that is looking to capture their own 3D images and videos. It's 12-Megapixel imaging sensors and 4x optical zoom lenses provide great quality and versatility. Read more in our Full Conclusion. 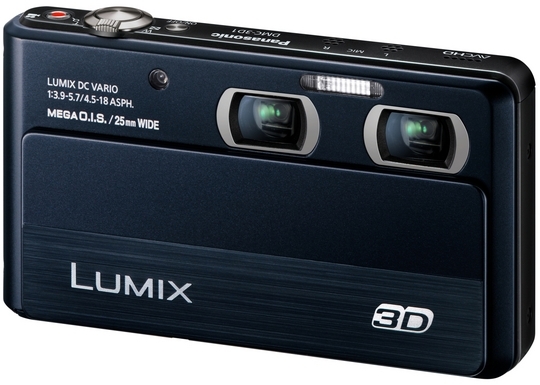 If you love 3D, Panasonic's has a new LUMIX series camera for you: the DMC-3D1. This compact, cutting edge digicam uses two lenses with "folded optics design" to capture 3D and 2D photos, as well as HD videos. While 2D photos are 12 megapixels and 3D shots are 8 megapixels, 2D and 3D video are both recorded at 1080/60i HD video (in AVCHD or MP4 compression codecs). Everything can be reviewed on the cameras sizable 3.5-inch touch screen. iA (Intelligent Auto) Mode will be helpful to any beginnering by combining: MEGA O.I.S, AF Tracking, Intelligent Scene Selector, Face Recognition and Intelligent ISO Control, Intelligent Exposure and Intelligent Handheld Nightshot to capture perfect shots in any shooting conditions. Intelligent Handheld Nightshot, by the way, is an interesting mode "which generates beautiful night scenery with illumination by layering multiple images shot consecutively, allowing bright, glamorous night scenery to be recorded without using a tripod." Seems impossible, so we're looking forward to testing out how this really looks. With the 3D1's dual lenses, users will have the option to record 2D video and photo simultaneously at different angles and zoom lengths. "Panasonic continues to lead the industry in 3D entertainment, giving consumers the opportunity to create their own content and then view it within their homes, and the new LUMIX 3D1 is an innovative digital camera that excels with its 3D imaging technologies, but also offers outstanding 2D photo capture options," said Darin Pepple, Senior Product Manager, Imaging, Panasonic Consumer Electronics Company. "With its twin-lens design, the LUMIX 3D1 can even shoot HD video through one lens and 2D photos from the other - thus getting still and moving content simultaneously, a unique shooting feature which Panasonic provides so users can stretch their creativity." The Panasonic LUMIX DMC-3D1 is available now with a MSRP of $499.99 USD. Check our buy box below for the most current online pricing.